With more than 1500 species of Ficus, 800 of which are actual trees it is exciting to find a new cultivar to bonsai. The “melon seed” as we know is great bonsai material due to tiny leaves. I have found that the interior leaves may grow a bit larger when the tree is full due to less light. Keeping the tree pruned on a regular basis will help eliminate some of that. Training for Ficus occurs almost all year long in south Florida with the majority of the work being done in the summer. Melon seed Ficus grow very quickly when the weather is warm and require constant pruning and wiring to achieve compact foliage. Once branches are established, to maintain shape, pinch out new leaf buds as they form. Remove large leaves completely or leave 1/3 of the leaf along with the petiole. To achieve full pads and leaf reduction you must constantly work the tree. Watch for scarring when using wire, wire scars occur quickly especially after a repot as the roots are stimulated and the tree wants to grow quickly. 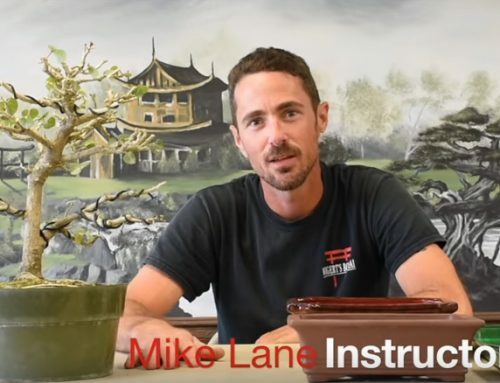 Repotting Ficus is recommended when the night time temperatures are above 65 and the trees are root bound or making a transition from nursery soil to bonsai soil. Make sure that the tree is defoliated completely to balance the stress on the tree. Gentle root work will ensure a healthy recovery as well as placing the tree in shade for two weeks keeping the soil moist. Ficus must be protected from cold temperatures. If the weather is predicted to drop below 40 degrees the trees need to be moved to a warmer location. Frost and freezing temperatures will severely damage or even kill the tree. Ficus are susceptible to thrips, mealy bug, scale, white fly, and spider mites among others. Spider mites may be present when the foliage dulls or turns grey. Look under the leaves for the mites along with spider web like fuzz. Control Mites with Avid. Apply Talstar for white fly, mealy bug and scale. Conserve will protect against thrips. Melon seed Ficus may be trained into any style the tree tells you. Depending on root structure, attitude of the trunk and overall size it lends itself to many styles. Although this style is found in nature, the style is rarely seen in Bonsai collections. This style is closely related to the clump style, except the base is swollen like a turtle shell. The surface roots of Ficus which sometimes swell into a bulgy base are the inspiration for this style. In the Korabuki style the number of trunks is uneven and the trunks never cross. The dominant trunk creates the focal point, and the smaller trunks support it. The clump style is often found in nature where seeds from the same plant or seedpod germinate to form a cluster of young plants. These plants grow together and the base fuse together later on to form a tree with a single roots system but with several trunks. The various trunks develop later on as single trees. To be able to receive as much sun light the trunks grow sideways in some cases to form a multi trunk tree. In Bonsai this style can be imitated by planting multiple trunks close together. These plants will eventually fuse to give the appearance of a multiple trunk tree with one root system. Although the Kabudachi style evokes a feeling of tranquility and seems easy to create, it however is one of the most difficult style to master. · When selecting trees it is important to select trees with different trunk lengths and widths. · Trees can be grouped together in numbers of three, five, seven or more. The trees should be well developed beforehand. · It is important that the trunks do not cross. · In triple trunk compositions there are a few options. The major tree can be placed in the center or on the sides, also the minor tree can be placed in the center with larger trees on each side. · The silhouette line forms a harmonious unit, and it could be triangular, dome or flamed shaped. The dominant trunk is the tallest and thickest, while the others become gradually smaller and shorter. The various crowns or apexes must be well developed.